In October 2012, the Obama administration set a red line on the use of chemical warfare in Syria, stating that crossing that red line would trigger American military retaliation. As reported in realclearpolitics the inaction of the US at the time significantly damaged US credibility. Trump, in reviewing this legendary failure, seemed to have learned the lesson, and reacted promptly in response to the most recent horrific chemical attack in Idlib province. Trump apparently launched 59 Tomahawk cruise missiles (see nbcwashington report) against the airfield, sending a clear message that the use of chemical warfare will not be tolerated and that there truly is a new sheriff in town who will not display weakness at the sign of such atrocities. To the credit of the media, the chemical attacks in Syria was reported extensively, including conclusive evidence from the autopsies of the victims (see stuff, theguardian, nytimes and others), and in the aftermath, Russian and Iranian responsibility were also raised. The reports of the Syrian chemical attack from the ground in Khan-Sheikhun in Syria were horrendous. The guardian reported “the dead were wherever you looked”, killing men, women and children indiscriminately. As they quoted: ”I found children lying on the ground, in their last breaths, their lips going blue”. Moreover, following the initial attack, the Syrian regime then launched between 8-10 airstrikes against the medical facility and the civil defense center which had collected the victims for treatment. The nytimes termed it a “toxic kill zone”. The question to be raised is the responsibility of Syria’s patrons. The nytimes quoted Secretary of State Tillerson, from an official statement, affirming “Russia and Iran bear a great moral responsibility for these deaths”. 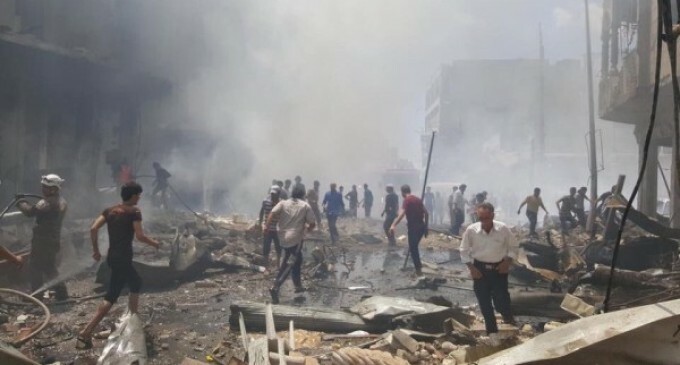 The Syrian network for human rights in sn4hr counts attributes more than 94% of the civilian victims to the Iranian Russian alliance with the Syrian regime. In the wake of the chemical attack, some called for practical steps to be taken against Syria’s patrons, especially Iran. UANI called for increased scrutiny of Iran’s support of Syria, especially the designation of the IRGC as a foreign terrorist organization. Heshmat Alavi in forbes titled his article “Massacre in Syria is Why Iran must be evicted”, stating that the main element behind this carnage is Iran’s involvement in Syria. Although Russia has played a part in the upkeep of the Assad regime, viewing the full extent of Iran’s involvement in Syria, as described in irannewsupdate, displays the fact that Iran’s role is much greater. In addition, Iran bears a special responsibility due to the fact that Syria expanded its chemical weapons supply with Iran’s assistance, as reported in the washingtonpost and aifdemocracy. The presence of IRGC officials at chemical tests as documented on youtube is further proof of this. An Italian blog nopasdaran2 has reported extensively on this. So, with condemnations of the chemical attack coming from all sides, and given Iran’s key role in preserving the Assad regime and assisting its chemical warfare program, it is time also to consider Iran’s responsibility and accountability.